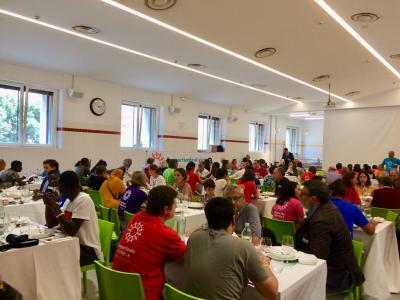 ROME - On Tuesday, locals, refugees and journalists alike were invited to the Caritas canteen on Via Marsala to take part in the ‘Share the Journey’ campaign. Launched by Pope Francis in September, the campaign aims to promote what the pontiff calls « the power of encounters »; through meeting people and exchanging life experiences we can gain a true insight into and empathy for the lives of others. He considers such encounters as an essential part of positive integration in Italy and as an initial step towards constructing a more inclusive and tight-knit society where the dignity of each person is the priority. Since its foundation in 1976, Caritas has protected the most vulnerable in society and since 2011, a central focus for the Italian branch has been the refugee crisis. Caritas’ work with refugees sets out to be as thorough as possible, providing aid from the moment of arrival until total integration into Italian society. On the shores of Southern Italy, they have provided over six thousand survival kits to those who survived the Mediterranean crossing. Caritas has rescued over 500 people from conditions of vulnerability in countries such as Ethiopia and succeeded in inserting them into Italian society. They have created a network of over 500 host families who welcome refugees into their homes with the intention of facilitating integration and creating bonds between local communities and new arrivals. Over an extended lunch the room was filled with conversation and laughter as stories were exchanged across the long tables. When everything eventually started winding down a young man, Korkiss Diallo, was invited to speak at the front of the room and share his experience as a migrant in Italy and how Caritas helped him find a home. Diallo left the Ivory Coast in 2011 aged 16 because of the war which broke out after the 2010 elections. After a long journey through Africa, Diallo finally arrived in Sardinia in 2014 when he was rescued from Italian waters during the dangerous crossing of the Mediterranean. Having secured his asylum, he came to Rome and was taken in by Caritas. They suggested that he took part in the ‘Rifugiato a casa mia’ (Refugee in My Home) project, which links up host families and refugees. Diallo stood alongside his Italian family at the Caritas lunch and his Italian ‘father’ stepped in to speak fondly about Diallo, remembering how he first arrived in their home without a word of Italian; today Diallo has completed his studies and training qualifications in Italian, securing several contracts as a piazza chef in restaurants across Trentino. Although he lives independently now, with his work in Trentino and friends around Italy, he still comes back to his Italian family for lunch every Sunday.